Description: It has a three position switch which allows the user to select a full-range level boost or to boost either the bass or treble range to change the tone of the instrument. In the Full position the Ranger provides 13 db of clean boost across the full frequency range; this can be very useful with inexpensive or low-output instruments in fattening up the sound or inducing amplifier disÂ­tortion. In the Treble position the Ranger produces an additional 12 db (25 db total) of boost in the treble range, while in the Bass position it boosts the bass range a total of 22 db without holding back the treble. The Bass and Treble positions are similar to regular tone controls except that they operate by boosting the desired frequencies rather than cutting out the undesired ones. 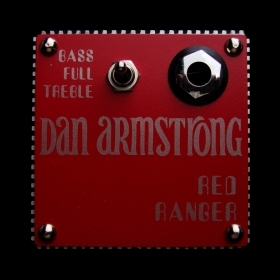 The Red Ranger also features a low 300 ohm Output Impedance in all three switch positions to eliminate signal loss and hum pick-up in long cables. Input Impedance is 110 k Ohms and the Signal-to-Noise ratio is 85 db. Dimensions: All six units are built in a sturdy, attractive aluminum housing with only the finest quality components. Overall dimensions are 59 m.m. wide x 59 m.m. high x 70 m.m. deep, although the unit protrudes only 43 m.m. from the face of a guitar. Weight is only 4 1/2 ozs., including battery. Power Source: Powered by a single 9 volt battery (included). For Recessed Output Jacks: Adaptors are available to facilitate use.